The King’s Speech works splendidly on a wide range of levels: as a funny and moving human story; as a document on an important but not widely known piece of history; and as an entertaining character piece with indelible performances. I went into it already aware of its high praise but still found myself responding to it on my own terms. That, I think, is the mark of a truly great film. It tells the story of King George VI’s offhand rise to the English throne and chronicles his inexperience and anxiety leading up to World War II. The title of film is a double entendre, referring not only to the actual speech King George VI gave in 1939 to the British people letting them know their country was at war with Germany, but also to his attempt to overcome his “bloody” stammer. After fumbling his speech at the British Empire Exhibition in 1925, the unbeknownst future king, Albert, a.k.a. 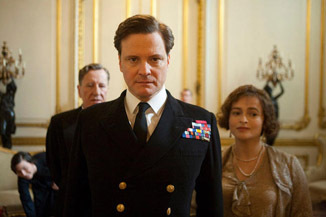 Bertie (Colin Firth), seeks the help of traditional doctors to correct his impediment. Most of them have antiquated notions for addressing his problem, like telling his majesty to fill his mouth with marbles and enunciating. If such a method worked for the ancient Greeks, who’s to say it wouldn’t work now? Bertie’s wife, Elizabeth (Helena Bonham Carter), seeks a different therapist, an Australian named Lionel Logue (Geoffrey Rush). He’s not like the other doctors in that he isn’t as hell-bent on paying reverence to Bertie as much as curing him. In a dark, damp and dreary little office, where you have to close two doors to the elevator, Lionel tells Bertie, “My house, my rules.” His highness shall not smoke; he shall call Lionel by his first name; and he shall pay Bertie a visit every day, with no ifs, ands or buts about it.